Top Trumps Football Legends - play online now! The Top Trumps Football Legends Slot Machine offers various features such as bonus rounds, free games and a gamble option. The Wild is represented by Pele and substitutes for all symbols except the Scatter and Bonus. The Wild itself offers great payouts when it appears on the reels and 5 Wild symbols enable the player to win 10,000 credits. The Top Trumps logo is the Scatter and gives access to the Free Games. 3 or more scatter symbols win 10 free spins with an extra Wild which the player can choose among the legendary players. The extra Wild substitutes for all symbols except the scatter and multiplies all wins by 4. During the free games round, three or more scatter symbols award the player 10 extra spins and these can be won indefinitely. The Wall of Fame bonus round is triggered when 2 Wall of Fame symbols appear on reels 1 and 5. The player is presented with pictures of 16 football legends and he needs to pick 3 among them in order to win cash prizes. Clicking on one of the pictures can also win the player an extra pick which will add to his winnings. 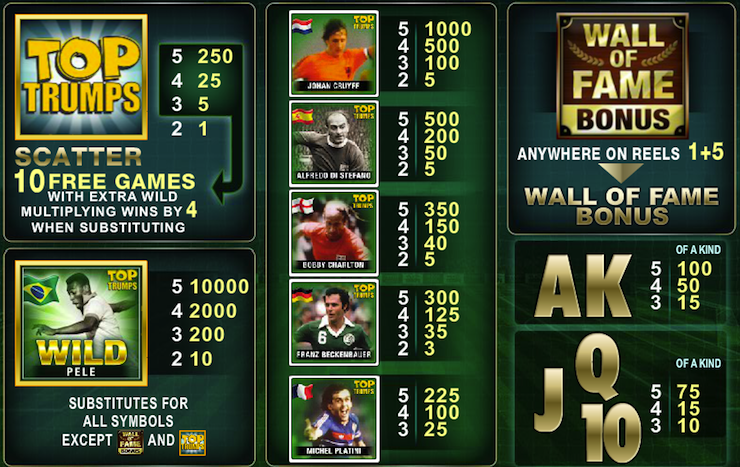 The Top Trumps Football Slots comes with a gamble option which offers players the opportunity to boost their winnings. After a winning spin, the player can click on the Gamble tab and is taken to the gamble screen where he can Double or Double Half his winnings.